In the fall of 2004, that theatre group, the Kempenfelt Community Players, or KCP, realized that a musical combining fairy tales with the positive character traits of “Character Education” adopted by many school boards across North America might provide an ideal performance piece for their Young Company to perform in schools. So, KCP commissioned children’s author Trudee Romanek to write such a show. The Tales of Andergrimm is the result. The story interweaves the familiar fairy tales of Hansel and Gretel, the Ugly Duckling, and Rumpelstiltskin, tying the three together in surprising ways. The memorable songs in the show display a wide range of musical styles, from rock and roll to tango to blues to rap. 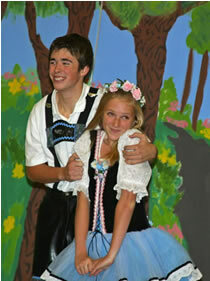 KCP’s traveling production of The Tales of Andergrimm was a huge success. In ten days the show captivated more than thirty school audiences and delighted their teaching staff. It also raised considerable funds for the volunteer theatre company. Wander through this web site, take a look at some photos and videos of the talented cast members from the original show, listen to some song clips, read what others say about the show, and peruse the technical information about staging the show. Perhaps this lively and topical show is one that your theatre company could put on for schools in your particular area. PLEASE NOTE that all of the material on this website is protected by copyright. Please respect our work and ask before using or linking to any text or images you find here. All photos are copyright Bob Buckley and used with his permission. All video clips are copyright Ratboy Productions and used with their permission. All dialogue, music and lyrics are copyright Trudee Romanek.